The Downtown Boys will be at Everybody Hits on West Girard Avenue Thursday night. Providence punks Downtown Boys make deeply political music. Their first album, 2015’s “Full Communism,” was aggressively activist, but they’ve never sacrificed musical urgency for their messaging. 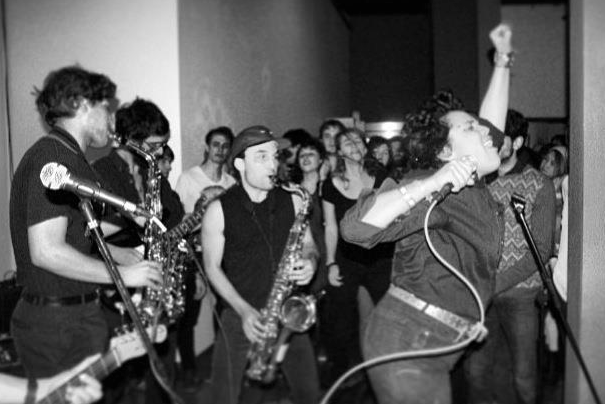 Instead, as evidenced by their latest single, the charged up and Spanish-sung “Somos Chulas,” Downtown Boys churn up singable, danceable rallying cries for justice and recognition. The globally-minded local collective Worldtown Soundsystem takes over a West Philly beer hall this Friday for a night of international dance music. DJs Ben Arsenal and Oluwafemi, directing the party from behind the decks, are joined by a crew of live instrumentalists as they spin international house and electronic sounds. For several years, beginning in 2005, the indie rock outfit Fake Problems released a slew of music and toured relentlessly. And then the childhood friends that made up the band called it quits. Frontman Chris Farren spent a couple years finding his way, recording as half of the duo Antarctigo Vespucci before stepping out on his own. In 2016, Farren found his stride with his official debut solo album “Can’t Die,” a self-assured indie pop record that’s equal parts pep and sorrow. A quiet giant on the Philly DJ scene, the globetrotting Skeme Richards holds down the home fort at Johnny Brenda’s this weekend for a soul and funk-fueled get down. Spinning his specialty— vinyl 45s—Skeme manages a careful balance for in-the-know crate diggers and unfettered dancers alike. An ascendant emcee out of Chicago’s fertile underground, Saba has fast become one of his hometown’s most exciting exports. After sharing stages and songs with the burgeoning superstar Chance the Rapper, Saba’s last album, 2016’s “Bucket List,” cast him as his very own auteur, and one that deserves every bit of your attention. More than a decade into their meandering career, the on-and-off again California duo Foxygen have released their most ambitious album yet. “Hang,” their third and latest record, folds an entire orchestra into their proven formula of quirky psychedelica. Longtime fans are aware of the group’s spotty record on tour, but also know better than anyone else that they leave it all on stage.